Dr. Brown was born and raised in Naples, Florida. He attended Stetson University in DeLand, Florida, where he received his bachelor of science degree. He later attended the University of Central Florida in Orlando before starting optometry school. Dr. Brown got his Doctor of Optometry degree from Nova Southeastern University in Ft. Lauderdale, Florida, graduating in 2002. In 2001, Dr. Brown did clinical rotations at Visual Health and Surgical Center in Florida and at Clayton Eyecare Center in Morrow, Georgia. Both sites specialize in the treatment of a wide variety of eye diseases including glaucoma and cataracts. Dr. Brown also completed his clinical rotations in pediatrics and contact lenses in 2002 before graduation. Upon graduation, Dr. Brown moved to Georgia where he eventually settled in Fayetteville where he lives with his wife, Leslie, his 2 daughters(2005,2008), and 2 dogs/4 cats. Visionary Eyecare was opened in August of 2008. OUR COMMITMENT TO YOU....A LIFETIME OF HEALTHY VISION. Ashley was born in Germany and had the privilege of living the first part of her life as an Army brat. The frequent moves that came with the military lifestyle enabled her to quickly adapt to any situation. She finally settled down in Sharpsburg with her husband Raymond, and their two children. Eventually, in 2005 she found her niche in the world of Optometry. She has been with Visionary Eyecare since its opening in 2008, and oversees the practice for Dr. Brown. She loves working for a private practice because it allows her to give the quality, one on one interaction with patients, while always maintaining a friendly atmosphere. She is Nationally Certified by both the American Board of Opticianry and the National Contact Lens Examiners. Ashley meets regularly with various reps to ensure that she provides our patients with the most up to date products and services available. 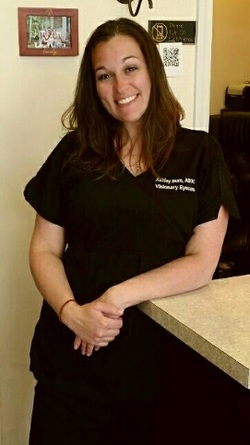 She is excited to be a part of such a great team that focuses on patient satisfaction and repeat customers. Sarah Lupo is a proud Georgia native, and is a die hard Georgia Bulldogs and Falcons fan. She enjoys attending various sporting events to cheer on her favorite teams. Sarah and her husband settled down in Fayetteville with their four children in 2009. She worked in customer service for over 11 years before joining Visionary Eyecare in 2013. 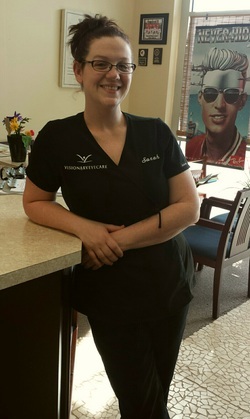 Sarah has been a valuable asset to our practice since joining our team. She immediately discovered she had a passion for the field of Optometry. She prides herself is providing excellent customer service, and has a close rapport with our patients; something she values and feels is the ultimate reward for working in a private practice. She is currently studying to obtain her National Certification by the American Board of Opticianry. She strives for excellence and that is evident in every aspect of her life. We are pleased to have her on our team.